We are relying much less on cash than we did years ago. Online payments are now a must-have thing for any service provider. Any contractor must be able to easily direct clients to a portal where they can pay for the services using a credit card. HireRush, a platform connecting customers with service providers, implements the integration of the Stripe account on its platform. Providers can issue invoices and send them to their customers in a split of a second, and, thus, carry out their transactions quickly and safely. Apart from issuing invoices and getting payments, service providers can track the history of their payments in HireRush dashboard, check what invoices are already settled and see the overall amount they earned through the HireRush platform. Using HireRush reduces number of outstanding invoices, helps tracking payments and allows service providers to get access to their funds much quicker. HireRush is a platform connecting reliable community-reviewed service providers with their prospective customers since May, 2015. The platform was initially launched to serve New York City but then grew bigger and now envelopes all 50 States with the current number of providers close to 60,000. 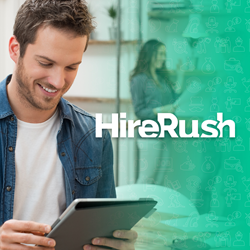 For more information about HireRush and its features, please visit https://www.hirerush.com/pricing, or call 646-781-8765.